Identify a wide range of common and uncommon conditions based upon their imaging findings. Arrive at diagnoses by following a pattern recognition approach, and logically overcome difficult diagnostic challenges with the aid of decision trees. Quickly grasp the fundamentals you need to know through more than 700 images and an easy-to-use format and pedagogy, including: bolding of key points and icons designating special content; Diagnostic Pitfalls; Really, Really Important Points; Weblinks; and Take-Home Points. Gauge your mastery of the material and build confidence with extra images, bonus content, interactive self-assessment exercises, and USMLE-style Q&A that provide effective chapter review and quick practice for your exams. 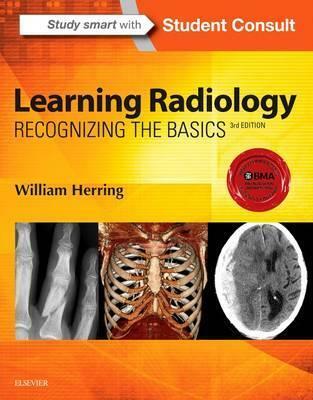 Benefit from the extensive knowledge and experience of esteemed author Dr. William Herring-a skilled radiology teacher and the host of his own specialty website, www.learningradiology.com. Stay current in the latest advancements and developments with meticulous updates throughout including a new chapter on Pediatric Radiology as well as more than 60 new and updated photos, many highlighting newer imaging modalities. Maximize your learning experience with interactive Student Consult extras videos/images of 3D images, functional imaging examinations, dynamic studies, and additional assessments. "This is a fabulous introduction to the basics and fundamentals of the various radiology and imaging modalities as well as pattern recognition associated with common and uncommon diagnoses.it is indispensable as a reference and would certainly make for a quick and comprehensive high-yield read prior to an in-service exam or the assumption of on-call responsibilities." -Ashwin Rao, MD (Medical College of Georgia at Georgia Regents University) Doody's Score: 96 - 4 Stars!